I was once told that fishing well in winter sorts the wheat from the chaff, and can sometimes require a more refined approach to that of the tactics used in the summer. Having altered my reel lines and tied new lighter hooklinks I decided to put this into practice on a small feeder stream off the River Aire that comes into its own when the river is in flood. Having fished the small stretch of water twice before, I knew it contained fish, but the recent cold snap meant that I was going to have to be a little bit more delicate than I had been previously. Departing from my standard 7lb ledger line and spooling up with 5lb main line (and 3lb hooklinks) I made my way down to the river bank, a trip which can be quite tricky in itself. Fortunately an unknown angler had recently re-cut the steps down to the swim which made it less precarious than it has been. Firing a few maggots out towards a small bush opposite I positioned myself and began to slowly trickle in the feed. 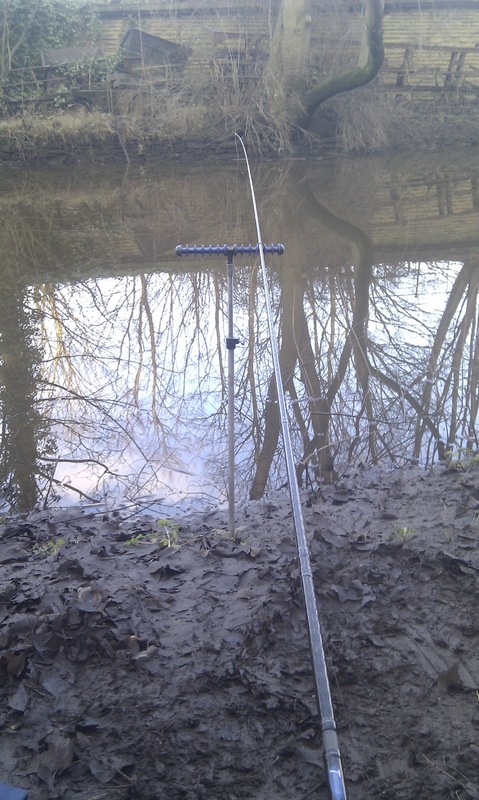 The stretch of water that I was fishing, although connected to the river, has very little movement or undertow so I was confident that I was slowly creating a bed of maggots and worms for the fish to feast on. Fishing the bomb was my plan of attack today and as the flow was almost nonexistent I could fish using one of the lightest bombs I had! A gentle underarm flick and I knew I had positioned my double maggot hook bait directly over the bed of bait I had spent 15 minutes slowly building. 10 minutes past before the quiver tip showed a slight knock, and after 2 more minutes waiting I wound in and saw that my maggots had been chewed on. With this in mind I went down a hook size from a 14 (I realise I mentioned fishing delicately, but I have had Chub out of this swim before which would have easily bent out most hooks smaller than a 14) to a 16, but to counteract the drop in hook strength I choose a strong Drennan Specialist and re-baited, casting back out with double red maggot. Leaving the hookbait out slightly longer than I would have normally, resulted in my first affirmative hook up of the day. Striking, I felt the fish power off up the stream and within seconds the hook pulled leaving one frustrated angler crouched on the bank cursing for changing hook sizes! The stream being so narrow meant that any activity in the swim leaves bites hard to come by for the next 20 minutes, so I began firing out small pouches of maggots (about 6 – 8 maggots each time) and re-introduced my hook bait after 15 minutes. 5 minutes later the tip started quivering before it ripped around and striking I knew the fish was on! It tore up stream and I tweaked the drag on my reel so that the fish didn’t snap through my 3lb hooklink. There were a few seconds when I thought the fish (which I hadn’t yet seen) was a Barbel. I knew the river held them and the way this fish was heading for the roots under the water, I thought this was about to be my lucky day. Then the fish jumped straight out of the water. It was a trout! And a reasonable one too, especially on quite light gear. 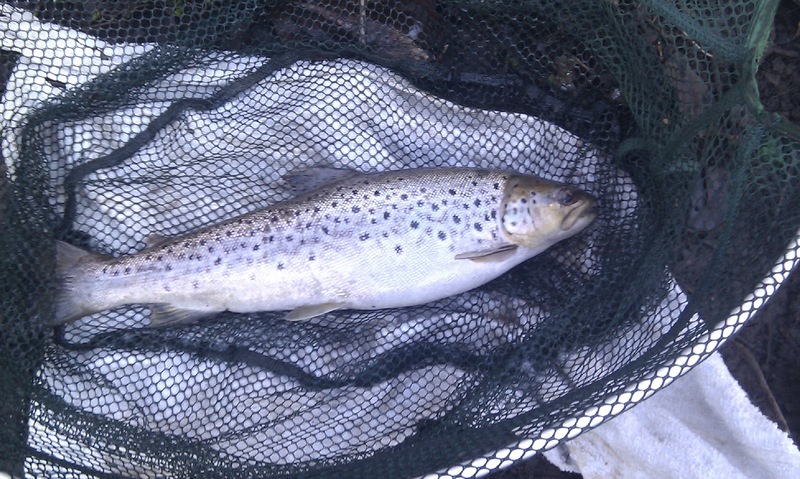 Netting the fish, I brought to the bank a lovely brown trout of around 2lb’s. Picking it up and quickly unhooking it I saw that the maggots I had been firing in hadn’t gone to waste. There must have been 10 – 20 of them all at the back of its throat (No wonder its belly looks so full in the photo!). Releasing the fish I saw that another local angler was making his way down to the bank. I quickly cast back out to my previous position not wanting to give up a prize spot when he set up and cast out one of the largest feeders I have ever seen. It caused a huge racket entering the water and at that point I knew any future fish from this peg were going to come on another occasion. This sadly brought the session to an end and I wound in my bomb rig. It was an enjoyable afternoon and although I didn’t catch any of the species I was going for, it was still very nice to tick off another fish that I haven’t caught since moving up north. This peg throws up some good fish from time to time and is one I hope to fish a bit harder next time; even if it involves a very early start. I just have to wait for the rain before it comes back to life again. 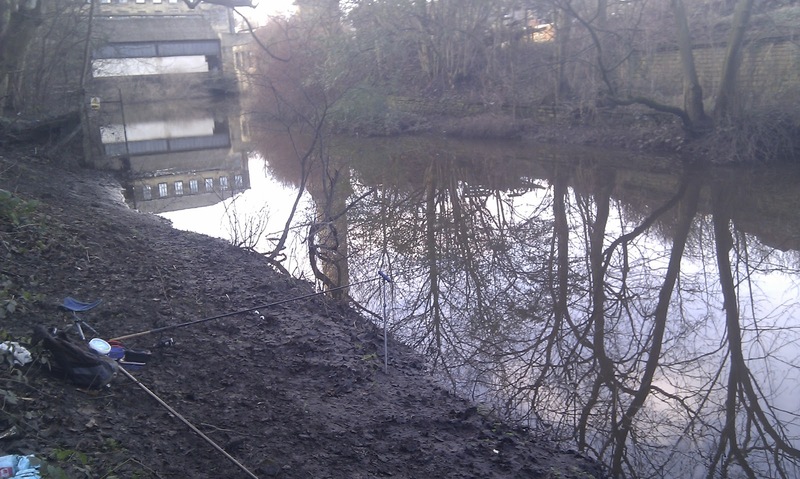 For my previous experiences of fishing this location please click here! mmmm, the guy with the huge feeder either didn't have a clue or he was poaching trout? you should have asked him how he usually gets on fishing like that? Good post Paul. Great to see such good sized trout this far down stream and acting naturally moving into the feeder streams off the main river through the winter. Really encouraging! I would love to know the stream but understand why you would not post derails. I grew up playing on the banks of Cow Beck which runs through Hawksworth Woods into the Aire. I would love to hear about trout returning to this lovely little stream. I doubt Feeder Man was poaching given the local ( not famed for it's trout) but a shame he spoilt your sport. Who knows if your catch is anything to go by you may end up having to put up with us Fluff Chuckers too! Good read that Paul. I'm an Aire angler too but lower down than where I'm guessing you are. I'm only targetting the pike for now, but on my trips have spotted some cracking fish of all varieties in the river and confident most stretches of the Aire are worth the effort. Thanks for the comments guys, I've been told by anglers and EA officials that the river is terribly peggy and the best swims are basically cut out of sections of banking which nobody knows how to get to, or waded into. On a walk this weekend I found an absolutely excellent section of water to fly fish and will be bring my waders and 7ft fly rod up from Wales next time I pop back. With regard to that particular swim, although hard to get to it is in an area which is frankly horribly abused by the less conservationally minded folk that live around there. On a recent fishing trip a group of youths decided to bombard the section of river down from my position with anything they could get their hands on. Branches, glass bottles, bags of rubbish and other things to boot which was incredibly frustrating as nothing could be done to stop them. Also, that particular peg would be incredibly hard to fish on the fly and the steep banking and over hanging trees making casting a short feeder rod difficult! I'll be trying a few places on the river over the next few weeks and will keep you all posted on any of my successes. there are some very strong hooks in even 20-22 sizes and equaly some that will bent very easy in bigger sizes. what a precise effort to go hunting deep down the stream and end-up with a successful catch like a trout.i surely have loads to learn from a perfectionist like you. Next story Trip #22 – An afternoon in the Freezer!